The Federal Highway Administration has developed the design details of the new signs added in the 2009 Edition of the MUTCD and signs whose designs have been modified in the 2009 MUTCD. 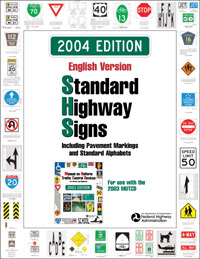 The new designs are provided in the form of a Supplement to the 2004 Edition of Standard Highway Signs. 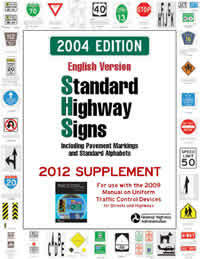 The contents of the 2012 Supplement will be incorporated into a new edition of Standard Highway Signs. This new edition will be released concurrently with the next edition of the MUTCD. This effort is programmed for 2017, however the timeline is subject to change. The new edition of Standard Highway Signs will contain the details for all signs and pavement markings in the MUTCD, expanded sign design guidelines, and details for symbolic traffic and lane-control signal indications. These links represent the current version of Standard Highway Signs and the 2012 Supplement to the 2004 Standard Highway Signs. The 2012 Supplement contains the new and revised sign designs adopted in the 2009 Edition of the MUTCD. Where a sign design is included in the 2012 Supplement, its previous design in the 2004 Standard Highway Signs is superseded. Together, these two documents are a companion to the 2009 Edition of the MUTCD. Try the new design tool to automatically determine the length of any traffic sign legend. Now, you can quickly and easily determine word lengths and estimate sign sizes based on the results. All the FHWA Standard Alphabet letter series—B, C, D, E, E(mod), and F—are supported for both upper- and lower-case letter forms. The tool can also be used to verify the output of sign design software programs. Undimensioned, full-size layouts for selected signs are provided for use by sign fabricators in the electronic fabrication process. These full-size layouts are made available in vector-based PDF and EPS formats that can be used directly with electronic vinyl cutting equipment.